Millions of lives could be saved and one billion people living in Asia could be breathing clean air by 2030 if 25 simple and cost-effective measures are implemented, according to this new UN report. 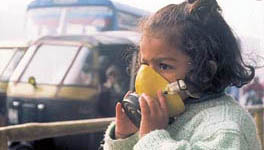 It is the first comprehensive scientific assessment of the air pollution outlook in Asia and the Pacific. Currently, about 4 billion people – 92 per cent of Asia and the Pacific’s population – are exposed to levels of air pollution that pose a significant risk to their health. The report, Air Pollution in Asia and the Pacific: Science-based Solutions, is the first comprehensive scientific assessment of the air pollution outlook in Asia and the Pacific. It details 25 policy and technological measures that will deliver benefits across sectors. According to the report, effectively implementing the 25 measures would result in a 20% reduction in carbon dioxide and a 45% reduction in methane emissions, preventing up to a third of a degree Celsius in global warming. Resulting reductions in ground-level ozone would reduce crop losses by 45% for maize, rice, soy and wheat combined.